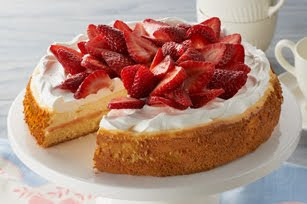 Do you love Strawberry Shortcake? If you said yes to both, why not combine them into one recipe? I received this recipe in an email from Kraft Food and thought I'd share. -REMOVE rim from 9-inch springform pan; set aside. Place bottom of pan on sponge cake; use as pattern to trim sponge cake to fit inside springform pan. Reserve cake trimmings for snacking or another use. Reassemble springform pan. Place cake in pan; brush with jam. -BEAT cream cheese, sugar and vanilla in large bowl with mixer until well blended. Add eggs, 1 at a time, mixing on low speed after each just until blended. Pour over cake. -BAKE 35 to 40 min. or until center is almost set. Run knife around rim of pan to loosen cake; cool before removing rim. Refrigerate 4 hours. Spread cheesecake with COOL WHIP just before serving; top with berries. Oh this just looks so delicious! I can see me this on the menu for our next get together!! I haven't opened my Kraft emails in a while.Thanks for sharing Im off to visit the site. Great looking dessert! Can't wait to see if it tastes as good as it looks.